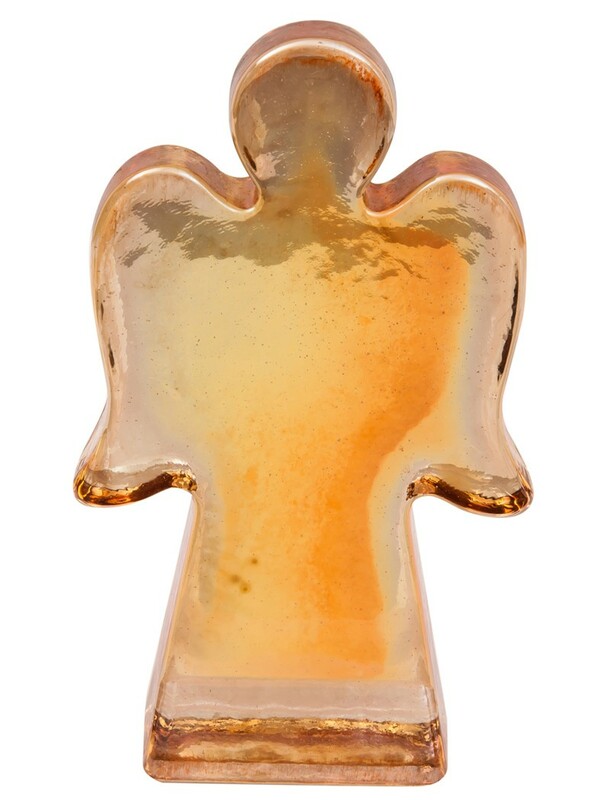 Glass yellow large sized lustered angel is designed and hand made by the artist, Yasemin Aslan Bakiri. Hot glass is shaped by liquid casting. Dimensions: Width 8, Length 13,5 cm, thickness 2 cm. Yasemin Aslan Bakiri graduated from Academy of Fine Arts at Mimar Sinan University, with a BFA degree in Ceramics and Glass, 1988. She received a Certificate in Communication Studies and CAM diploma from The London Institute, London College of Printing and Distributive Trades, 1992. 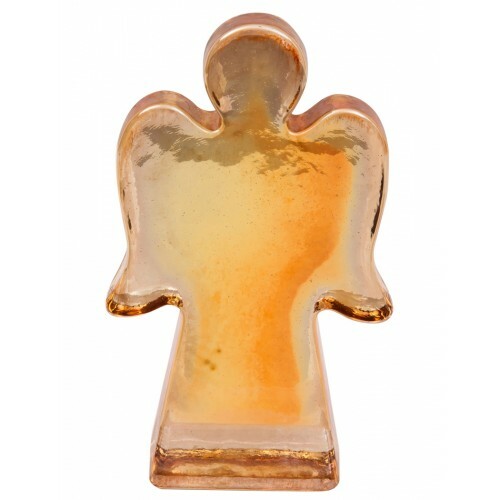 The artist continued her studies in England at The Surrey Institute of Art & Design University College, specializing in 3Dimensional Design,in Glass, 1995. She has worked with various international artists such as Annette Meech, Christopher Williams, David Taylor,Fleur Tookey. Since 1986, her work has been featured in exhibitions art events and held in the museum ,private collections worldwide. She is a visiting lecturer at the Faculty of Fine Arts in glass department and Industrial design department at Anadolu University. 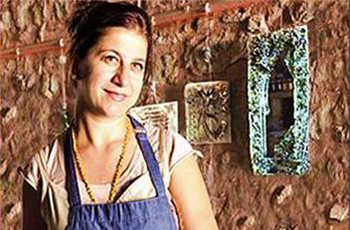 She runs a Glass Art center called ‘Camhane’, a historical building in Balat, İstanbul, and continues to work from her studio . She specializes in sand- cast glass techniques using ideas relating to the natural world, nature as a theme for her plainness and dynamism… In her work she uses timeless simplicity to provoke a powerful sensation of colour and movement. She is interested purely in the spontaneous reactions of the glass, using different materials in her works, wires and hand-woven metal meshes. the splendour of the Ottoman Empire in contemporary forms to portray the fluidity and purity of glass and her metal-weaving technique. The “Glass Kaftans” are contemporary sculptures to historical references in our minds . They create an unparalleled visual game in our minds through the force of timeless mediums of glass and metal. Aslan Bakiri’s glass sculptures are made from layers of hot glass formed manually .She works spontaneously to create the forms before giving the glass the chance to cool.